The White House wasn’t always white! It is built from gray sandstone and was not painted white until the building was reconstructed after being set on fire by the British in 1814. 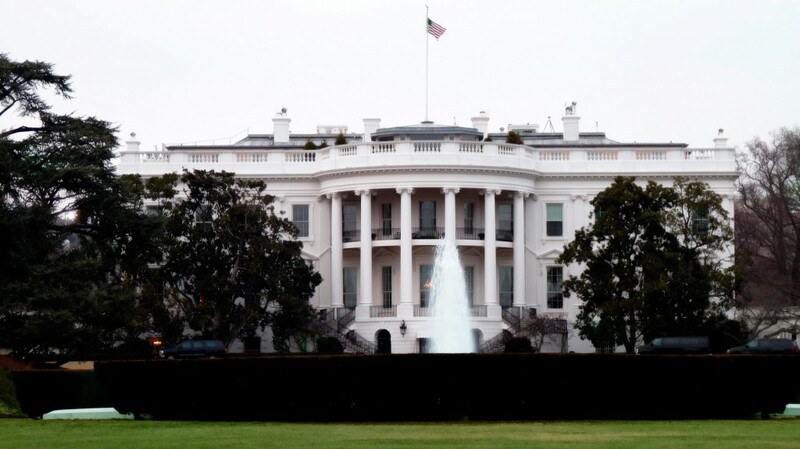 The first paint used on The White House was made of rice glue, casein and lead. The interior of the building was destroyed and the exterior badly charred. The White House was reconstructed enough to be lived in by 1817 when President James Monroe and his family moved back in, but even then it was not completed. Lead was often used in the 18th and 19th centuries, but was found to be unusable for The White House because of the climate of Washington, DC. The extreme temperature changes and summer heat would make the roof crack and leak and lead could even slide down the roof. Lead also makes an appearance in stories about The White House plumbing, but although widely believed, it was a hoax. Then Vice President Millard Fillmore was reported to have seen a mahogany and sheet lead tub in Ohio and ordered one for The White House when he succeeded Zachary Taylor. The hoax was perpetrated by journalist H.L. Mencken, who said that he had created the story to distract people from the horrors of World War I. The story was later known as “The Mencken Hoax.” But due to reprintings of the story after the author confessed, the hoax has remained part of our stories. The hoax was even referenced seriously by the Washington Post as recently as 2001! Do you remember Millie, the family dog of President George H.W. Bush? A lovely English Springer Spaniel born in 1985, she was the “Second Dog” while Mr. Bush was Vice President, but was promoted when he was elected President in 1988. Unfortunately, she died in 1992 of lead poisoning from lead dust released in White House renovations. Remember, environmental hazards affect pets as well as humans! One more: The White House heating and air conditioning system was renovated in 1986 as the last phase of a 10-year project begun in 1977. Asbestos which had not been exposed until the renovations was removed while the Reagans were on vacation in California. It had been removed from the Executive Office Building the previous year. Today’s White House is safe from asbestos and lead contamination, thank goodness! If your house was built before 1978 or you are doing renovations and find asbestos containing materials during the process, you may need lead paint removal or asbestos abatement services. If you are in California, contact Alliance Environmental Group for a consultation. We have highly trained crews ready to tackle your worst environmental challenges!